On July 23, Poet LLC received an approval from the Shelbyville, Indiana, planning commission that will allow it to proceed with the development of an 80 MMgy ethanol plant at a site approximately 5 miles northwest of the city. President Trump indicated his administration is “very close” to implementing a Reid vapor pressure (RVP) waiver allowing for year-round sales of E15 at an event in Dubuque, Iowa, July 26. On July 20, the U.K. Department of Transportation opened a public consultation on whether and how it should introduce E10 fuel. The country currently allows gasoline blends that contain up to 5 percent ethanol. The USDA will authorize up to $12 billion in aid to assist farmers who have been impacted by retaliatory tariffs. The ethanol industry also called on the Trump administration to provide RVP relief for E15 as a way to aid the farm community. Valero Energy Corp. has released second quarter financial results, announcing that its ethanol segment reported $43 million of operating income for the three-month period, up from $31 million during the same period of last year. 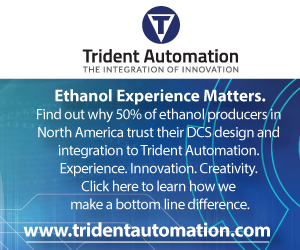 American Coalition for Ethanol Senior Vice President Ron Lamberty recently traveled to Chihuahua, Mexico, for the fourth of six technical ethanol workshops the U.S. Grains Council is holding for Mexican petroleum equipment installers and retailers. Nebraska Public Power District is participating in a Department of Energy study that aims to develop an integrated carbon dioxide collection, transportation, and storage infrastructure in the Midwest for ethanol facilities and nearby power plants.